Scott and Heather Staples have long hatched plans to open a burger joint. 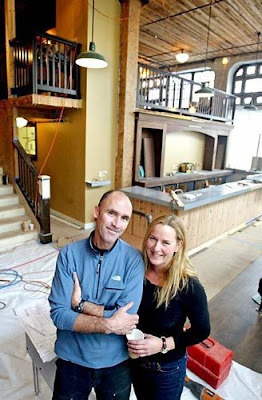 In fact, that’s what they’d hoped to do before falling in love with the location that would become their stunning Pike/Pine gastropub, Quinn’s. That corner spot was way too big for their burger ideal, but they made the best of the situation. Since then, they’ve kept their eyes and ears open and eventually found the perfect spot — in Fremont. Welcome to Uneeda Burger, now under construction at 4302 Fremont Avenue North, just down the street from Marketime Foods, up the block from Brad Inserra’s Swingside Cafe and a stone’s throw from Paseo. The 40-year-old building — once home to Uneeda Auto & Boat Rebuild and more recently Urbanweeds — came with a perfect name. Come on! How much money would a big burger company have to pay a marketing team to come up with the name Uneeda Burger? Call it kismet. As if that wasn’t enough, the place comes with a built-in contractor and business partner: Adam Turner, whose company Dovetail General Contractors resides on-premise. That’s Dovetail, right. And the future home of Uneeda Burger (smaller roofline, at left). 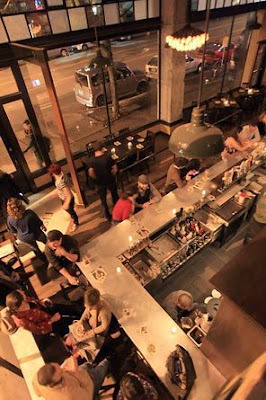 It was Turner and crew who built such talked-about restaurant spaces as La Spiga, Oddfellows, the new Sitka & Spruce and The Walrus & the Carpenter. Oh yeah: and the Staples’ other baby, Quinn’s. The scene before [Seattle Times photo, Greg Gilbert] and after [Seattle Times Photo, Jim Bates] at Quinn’s Pub, sibling to the Staples’ 10-year-old Belltown bistro, Zoe. “We loved working with them at Quinn’s and became friends,” say Scott Staples, who’s as excited about opening his dream-of-a-burger-joint with Turner’s help as he is about the physical plant, expected to make its burger-flipping debut in December. “Simple, hand-built construction” will enhance the 35 to 40-seat restaurant in the double-bay garage space, he explained. “Picture the kind of shed roofs you park boats under. One will come off the north bay and make it light and airy — like the [enclosed] deck at Kushibar” in Belltown. Sliding doors will open onto a warm-weather patio. But it’s the menu that really gets the chef fired up. His inspiration came from New York restaurateur Danny Meyers’ Shake Shack, and Northern California winemaker Joel Gott’s burgers-and-more store Gott’s Roadside (fka Gott’s Refresher) — where half-bottles of wine are part of the package. “We’ll have two levels of burgers,” he says of his proposed menu: “Your standard quarter-pound Painted Hills beef” and — for a buck or two more — grass-fed beef from Thundering Hooves. Otherwise, expect the same kind of menu-structure with the same kind of prices you’ll see at a typical burger-shop, Staples says, with combos like bacon and cheese, mushrooms and onions, along with chicken and vegetarian burgers. Additionally, he’ll offer weekly burger specials made with the likes of lamb, elk or bison. “We want to offer the everyday experience people would get if they went to Zippy’s or Red Mill or Blue Moon, but we also want to give people the opportunity to move up to other interesting fun selections,” the chef says. Speaking of fun, employees at his existing restaurants are already cracking jokes about Uneeda’s menu-board, suggesting fries and other add-ons be listed under “Uwanna side?” Me? 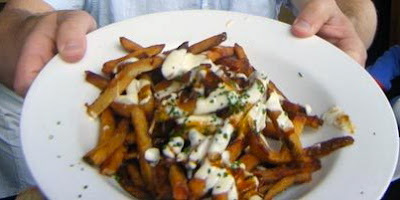 I’d insist they offer a Fremont version of Quinn’s fonduta fries. Ugotta taste ’em. Staples says they haven’t yet decided whether to use house-cut fries or to purchase them, but either way, chili-cheese fries are on the docket. Fussy cheese and fancy gravy? They’ve got ’em at Quinn’s, we need ’em at Uneeda. Milkshakes will be built with Empire Ice Cream, whose co-founder, Tom Durchman, has been tending bar at the Staples’ Restaurant Zoe for years. There will also be beer on tap, more in bottles, and inexpensive wines by the glass — with better labels available in half-bottles a la Gott’s. Only a couple-few months out from opening, Uneeda Burger is certain to add some excitement to the local burger scene. “With Blue Moon down the hill,” near the Fremont Bridge, “and Red Mill on Phinney, I’m definitely jumping into the fire with it,” Staples says. Asked whether the rumors I’ve long been hearing about Restaurant Zoe blowing out of Belltown were true, the chef admitted, “We are definitely considering leaving Belltown.” On the other hand, with a lease in place, he’s also considering staying put and “looking at doing an interior renovation.” However, with those costs in mind, great deals on leases available elsewhere and a new influx of SBA loan-money to be had, he and his wife will keep their eyes and ears open — and continue to weigh their options.